In this project we are going to make a PIC based Car Battery Monitoring system on PCB. Here we have designed a PCB using EASYEDA online PCB simulator and designer. This Car Battery Monitoring Circuit is used to monitor the power of Car Battery by just plugging it into the power outlet on the dashboard of a car. 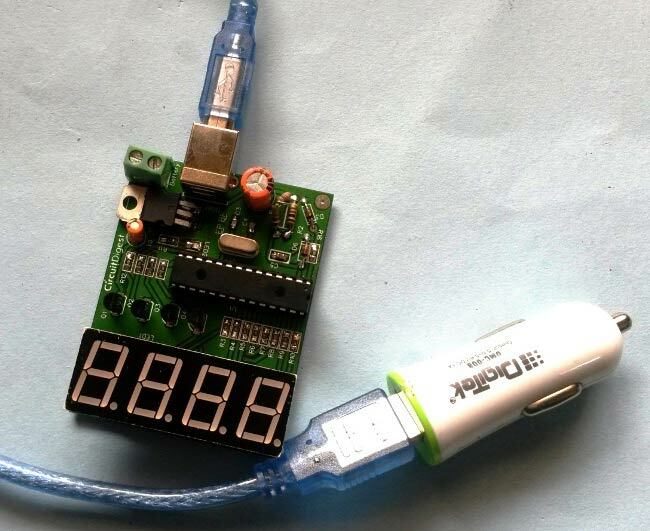 The PCB also has the option to use it as Voltage Measurement tool or Voltmeter without using USB car charger. We have attached a terminal block here to measure the voltage of other power sources, just by connecting two wires in it from the power source. Generally it is not important to measure the car battery power every time, but we often need to know about battery voltage during charging, to check whether its charging or not. By this, we can protect battery failure due to the faulty charging system. The voltage of a 12v car battery during charging is about 13.7v. So we can identify whether our battery is charging well or not and can investigate the causes of battery failure. In this project, we are going to implement a Voltage Meter for Car Battery by using a PIC microcontroller. Car Cigarette Lighter or Car USB charger is used for getting the battery voltage to the ADC pin of the microcontroller with the help of Voltage Divider Circuit. Then a 4 digit seven segment display is used to show the voltage value of battery. This circuit can measure the voltage up to 15v. When a car battery is charging, then the voltage across the battery terminals is actually coming from the alternator/rectifier, that’s why system reads 13.7 volts. But when the battery is not charging or car’s engine is not ON, then the voltage across battery terminal is actual battery voltage around 12v. We can also use the same circuit for measuring the voltage of other power sources up to 15v. For this purpose we have soldered the Terminal Block (green color plastic block) in PCB where you can connect two wires from power source and can monitor the voltage. Check the Video at the end, where were we have demonstrated it by measuring the voltage of a Variable power Supply, a USB power bank and a 12v AC-DC adapter. Also check the Simple Battery Monitor Circuit and 12v Battery Charger Circuit. In this Battery Voltage Monitoring Circuit, we have read car battery voltage by using an inbuilt analog pin of PIC microcontroller and here we have selected pin AN0 (28) pin of microcontroller through a voltage divider circuit. A zener diode of 5.1v is also used for protection. 4 in 1 seven segment display is used for displaying the instantaneous value of car battery voltage that is connected at PORTB and PORTC of the microcontroller. A 5v voltage regulator namely LM7805 is used to powering the whole circuit including Seven Segment Displays. A 20 MHz crystal oscillator is used to clock the microcontroller. Circuit is powered by the USB car charger itself by using a LM7805. We have added a USB port in the PCB, so we can directly connect car USB charger to the circuit. Car USB charger or Cigarette lighter provides 5v regulated supply from the 12v power outlet of the car, but we need to measure the actual voltage of Car battery so we have tweaked the Car charger. You need to open the car USB charger and then find the 5v (output) and 12v (input) terminals and then remove 5v connection by rubbing it with sand paper or with some hard thing and short the USB output terminal to 12v directly. First open the 5v connection from the USB port in the car USB charger and then connect 12v to the USB port where 5v was connected. As shown in below figure, we have cut the red circled connection, it may differ in your car charger. To configure ADC here we have selected analog pin AN0 with an internal reference voltage of 5v and f/32 clock for ADC conversion. In this project we are reading car battery voltage that is (generally) around 12v-14v. So we have done this project assuming max 15v means this system can be read max upto 15v. To design a Circuit for Car Battery Voltage Monitor, we have used EasyEDA which a free online EDA tool for creating circuits and PCBs in a seamless manner. We have previously ordered few PCBs from EasyEDA and still using their services as we found the whole process, from drawing the circuits to ordering the PCBs, more convenient and efficient in comparison of other PCB fabricators. EasyEDA offers circuit drawing, simulation, PCB design for free and also offers high quality but low price Customized PCB service. Check here the complete tutorial on How to use Easy EDA for making Schematics, PCB layouts, Simulating the Circuits etc. After getting the PCBs I have mounted all the required components over the PCB, and finally we have our Car Battery Monitoring System ready, check this circuit in working in Video given at the end. Program of this project is little difficult for beginners. To write this code we need some header files. Here we are using MPLAB X IDE for coding and XC compiler to build and compile the code. The code is written in C language. In this code, we have read battery voltage using an analog pin and for controlling or sending data to 4-digit seven segment display, we have used Timer Interrupt Server Routine in PIC microcontroller. All the calculation for voltage measurement is done in the main program routine. First, in the code we have included a header and then configured PIC microcontroller using configuration Bits. Now in void main() function, we have initialized timer and interrupt. And then in while loop, we read analog input at the analog pin and call some function for calculations. Given adc_value function is used to read input from the analog pin and calculate voltage. And given convert function is used to convert voltage value to segment supported values. Check the Complete code for this project below with a demonstration Video. I have been working on this project for about a week now. The voltage regulator is giving me the needed 5V output. My microcontroller is giving me outputs, but my 4 digit 7 seg led isn't displaying anything. the leds for sure work, but arent working for this circuit. Any suggestions? Are you using 4 different 7 segment displays or 4 in 1 seven segment display module. I'm interested in putting this together. Sawyer, I'd check the schematic of the seven segment display with the type of transistors used. The ones in the schematic show pnp before the LED load. But some segment displays may require npn transistors if there Pinout is after the LED load. This is just my initial guess from seeing your question.